Its original indigenous name refers to a deity whose temple can be found close by. But that is not the beach’s main attraction. Echo Beach is part of a series of beaches - Berawa, Seseh and Pererenan - in the Canggu region that is appreciated by surfers. The reef breaks sends up wonderful swells of waters; these waters are for advanced surfers only. There are shacks along the beach selling and renting surfing equipment if you haven't brought your own. The beach is also a lovely spot to take in the sunset, and cafes and restaurants have been established along on a small cliff overlooking the water. 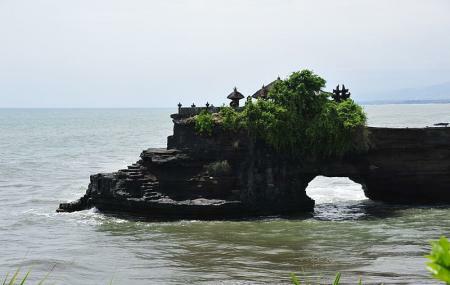 There, you’ll also find the ancient temple that gave the beach its original name. How popular is Echo Beach? People normally club together Gitgit Waterfall and Penglipuran while planning their visit to Echo Beach. Nice place to view the sunset while having your dinner. You can have seafood with plentiful of side dishes with reasonable price! They also have really good sense of music. A great place to sit back and relax! Beach is kinda average, nothing too spectacular. But a fun, chill place to lounge at. You can rent 2 beds or bean bags with an umbrella and a table for 50k (25k each). You can order food and drinks from your spot. There are a lot of dogs on the beach. If you're going just to relax , I recommend. They also have surf lessons available and you can kinda get in the water, but it's kind of hard because of all the surfers there are. Beds and beans bags were very clean for the most part. You can find parking about 15 meters or less away from the beach for free, though very limited, if not you can park in a lot for 2k, which is super cheap. Great place for family dinner. Highly recommend to meet sunset here. We had many fun. The food is delicious. Staff is friendly. Sitting here you can feel the breeze:) Good for bringing your wife for any holiday. Children also can have fun here. The local fishermen are fishing just behind the fence, so your children can be involved in to a process. Good food and environment but pricey for local standards as they primarily cater to tourists. I visited during happy hour (4 pm to 6 pm) where they have 50% off cocktails. Ordering here is weird - you order at the cashier with your name and table number and they bring your good to you. Look, it's crowded, food is just okay, yes you're packed in like sardines, but then some people like this. I ordered a BBQ Chicken pizza and it was only 750k which is a good price. It had waaayyyy too much cheese. All other pizzas I saw served also had way too much cheese. Took off nearly all the cheese and it was great. Went here a few years ago and sat in the "adult" section with proper tables and such. Service was good. It rained briefly (this is February so there's brief storm showers most days but it clears and it's cooler). Sunset at this time of year is about 6:45pm. Worth it.